Spine Partners Wahroonga understands the central role of the GP in patient health. We also appreciate the challenges of forging any new professional relationship. So we embrace a collaborative treatment approach, and ensure that our communication is clear, relevant, and timely. 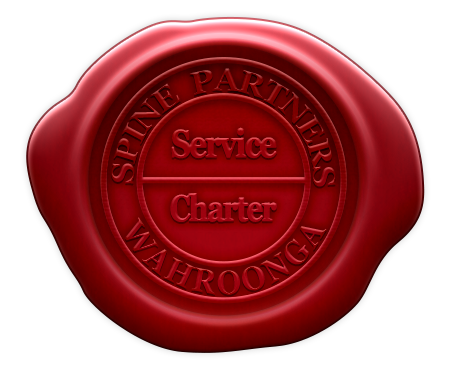 Spine Partners Wahroonga has established its reputation at the forefront of evidence-based practice. Since our inception in 1992 we have worked hard to foster good relationships with our medical colleagues, based upon a firm foundation of science and clinical reasoning. We appreciate the trust required to refer one of your patients, so we will always provide you with a comprehensive diagnosis, logical explanations and individualised patient treatment. The field of spinal diagnosis and management is a crowded one. It is also an area that teems with contradictory theories and unproven treatments. As such, many GPs find the topic of spinal pain an exercise in frustration. Fortunately, Spine Partners Wahroonga can help. Both Matthew Long and Anthony Nicholson have lectured extensively in neurology and clinical diagnosis at Macquarie University over many years. In addition, they founded Clinical Development International (CDI) - one of the largest and most highly respected providers of continuing education for chiropractors in Australia, and around the world. CDI’s extensive library of online learning programs are now assisting chiropractors to work towards achieving specialist level board certification in the United States (in collaboration with the University of Bridgeport, Connecticut). Matthew Long graduated from Sydney University with a Bachelor of Science prior to undertaking his Masters degree in Chiropractic at Macquarie University (dux). He established the Wahroonga practice in 1992 and has also been involved in chiropractic education since this time, both as a lecturer at Macquarie University and in post-graduate training programs. Matthew has always emphasised a multi-disciplinary approach to patient care and enjoys the highest level of co-operation with his medical peers. He has an active interest in research and is Chief of Research and Cofounder of Clinical Development International (CDI), a continuing education organisation for chiropractors that delivers evidence-based education around the world. Anthony Nicholson is a partner of the Wahroonga Practice and an adjunct senior lecturer in neurology at Macquarie University. As an experienced and evidence-based diagnostician, Anthony works largely by medical and specialist referral. He completed his undergraduate training at the University of Queensland and his Clinical Masters degree (dux) at Macquarie University. Anthony then went on to complete further specialised training in clinical neurology to become a diplomate of the American Chiropractic Neurology Board, and then in orthopaedics to become a fellow of the Academy of Chiropractic Orthopedists (one of few chiropractors worldwide to be board certified in both disciplines). Anthony plays a key leadership role in the continuing education of other chiropractors. He is the CEO of Clinical Development International (CDI), a continuing education organisation for chiropractors that he cofounded in 2002. Anthony speaks in Australia and internationally on a regular basis and CDI has grown to deliver professional continuing education to chiropractors across Australia, New Zealand, UK and the United States. Susan Carnegie has a first class Bachelors of Science Honours degree in Chiropractic from University of Glamorgan Wales and received the award for Clinical Excellence. She has extensive clinical experience across both hemispheres, and enjoys a close working relationship with her local medical community. Most recently she has completed a Post-Graduate Certificate in Clinical Management of Pain. The word 'chiropractic' is often seen as synonymous with 'manipulation', while 'chiropractic treatment' is also equated with a manipulation-only approach to health. However, 'chiropractic' is simply the name of the profession, and 'manipulation' is just one tool amongst many treatment options. Of course, manipulation is also used by physiotherapists and orthopaedic specialists, so it is not uniquely restricted to chiropractors. However, a tool is only as good as the knowledge that underpins its use, and this is where diagnostic expertise is crucial. At Spine Partners Wahroonga we understand the importance of appropriate patient selection. Spinal disorders are complex and varied, and the associated research literature is expanding with the same ferocity as any other field of medicine. That is why we maintain a tight focus of expertise in spinal diagnostics and pain. We also appreciate the benefits of collaboration, and maintain good relationships with local physicians, surgeons and interventional radiologists. IS THERE AN OVER-RELIANCE ON PASSIVE TREATMENT? Treatment dependency is a problem that faces clinicians of all persuasions, including chiropractors. Indeed, there is a strong perception that their approach is largely passive, and that exercises do not feature strongly in overall management. At Spine Partners Wahroonga we see physical movement and exercise as the central pillar of recovery. However, even a cursory review of the rehabilitation literature will quickly highlight the differences of opinion that exist about the role of exercise. Traditional management of spinal pain has evolved over recent decades. The initial paradigm emphasising rest gave way to methods of strengthening spinal muscles, particularly the so-called 'core' groups. This was subsequently refined to a tailored approach, in which specific exercises were individually designed for the deficits that a particular patient might exhibit. But has all of this refinement led to better outcomes? There is now a growing undercurrent of dissatisfaction in the literature with tailored exercise programs, and a re-evaluation of our thinking about what exercise actually does for spinal pain patients. Our attempts to specifically target individual muscles that are deemed to be weak/tight/sluggish does not seem to improve outcomes. The human brain stores motor patterns in terms of desired functions (such as walking, typing, or swinging a golf club). As such, targeted exercises that aim to strengthen the gluteus maximus, or activate the transverse abdominus, or strengthen the ‘core’ while lying on an exercise mat, do not seem to help the next time we go for a walk, or bend to remove our shopping bags from the car boot. In essence, the human brain needs to practice performing real-world functional movements and not the individual sub-components of a larger activity. For this reason, we emphasise a realistic, functional approach to exercise - allied with a thorough education program. Patients need to understand the reason for their pain, so that they can develop a sense of control. Unfortunately the reasons for spinal pain are legion, but we must seek to understand these factors from the outset. An individual who exhibits joint hypermobility and connective tissue laxity will be managed entirely differently to someone more robust. Similarly, the patient with osteoporosis requires a gentle touch and tailored advice. Of course, the complexities of the chronic pain patient go much deeper, and we are often faced with those who are genetically geared to suffer longer. For these individuals the role of education, counselling and exercise must come to the fore. Finally, the patient with recurrent pain episodes needs to understand where their 'weakness' really lies, and it is usually a problem of muscular control, not simple strength. Our reasons for using imaging are quite straightforward. We will only use an imaging modality if it will help us to answer a question that we couldn't resolve some other way. For these reasons we may ultimately use MRI in preference to X-ray. Given MR's ability to detect fluid concentrations, it is also highly valuable in identifying facet joint effusion and other inflammatory processes. This is useful for planning management and specifying the target for injection procedures. Chiropractors can refer for plain-film X-rays and MRI scans. We use them judiciously, and always with diagnostic intent. Cervical manipulation has garnered its fair share of criticism over the years. However, an unbiased look at the literature shows that the truth is more nuanced than the headlines might suggest. There can be no dispute that any treatment may cause harm if applied indiscriminately. As such, it is the responsibility of the clinician to ensure that their patient is a reasonable candidate for the proposed treatment. Spinal manipulation is no different, and there are both relative, and absolute, contraindications to its use. We are very aware of these factors, and our practice is conservative as a result. Chiropractors typically use a variety of manual treatments, and spinal manipulation is only one such technique. Furthermore, the word 'manipulation' is simply an umbrella term that describes a range of joint mobilisations. It is not a 'one size fits all' modality, and all techniques are graded according to the tissue integrity of the patient. Such considerations include the connective tissues that we directly address, as well as potential complications of the vasculature. The possibility of vertebral artery dissection following neck manipulation has been a persistent concern over many years. However, the vexing problem of association versus causation appears to be very real. The literature documents many known dissection triggers, including hair-washing at a beauty parlour, yoga, painting a ceiling, and reversing a car. Each of these inciting events has been linked to vertebral artery dissection - but only in an individual already predisposed. There is no suggestion that hair-washing is independently dangerous. The literature has highlighted many risk factors for vascular fragility, including Ehler's-Danlos syndrome, Marfan's syndrome, fibromuscular hyperplasia, hyperhomocysteinaemia, oral contraceptive use, and even migraine. Furthermore, affected individuals are liable to initiate a vertebral artery dissection through innocuous daily activities. Unfortunately, such dissection typically produces neck pain and sub-occipital headache prior to stroke, driving the sufferer to seek out help and thus drawing chiropractors (or even massage therapists) into the pool of known possible triggers. Indeed, the most convincing evidence now suggests that the primary role of the chiropractor in such situations is one of concerned bystander, not causal agent. Of course, it is possible that an over-zealous chiropractor may aggravate an underlying lesion, or fail to make the diagnosis when such patients present. But this is a far cry from the persistent theory that neck manipulation is capable of producing a dissection in an otherwise healthy individual. Urgent appointments are available, so please do not hesitate to phone our office on 02 9487 2161. Otherwise, please use the Priority Referral Form below and we will contact your patient directly. Thank you for contacting Spine Partners Wahroonga. We will contact your patient directly to organise a suitable appointment time. Following this, we will send through our initial report and suggestions for management.